Still trying to paint at least one thing a day, whether it's a speedy environment or a creature/character. In addition to designing new creatures for the Aerie, I'm also planning on revamping old ones. 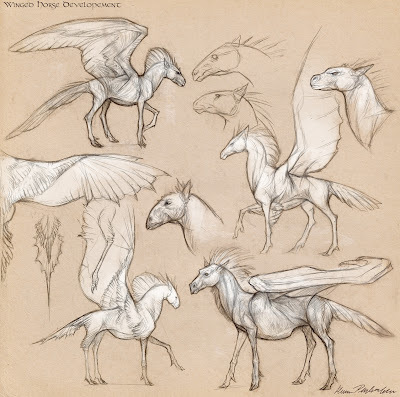 Dragons, gryphons, winged horses, etc. And anything with six limbs and this kind of body plan is going to be related. Dragons will be the oldest of the hexapods, with creatures like wyverns, wyrms, winged horses, and gryphons stemming off of them, losing limbs as necessary. 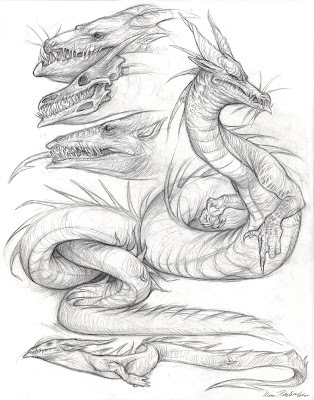 Wyrms are very old, specifically lindworms (serpentine dragons that possess only arms). For these varied creatures I'll need to create multiple iterations. Some will be more serpentine, while others will resemble modern "drakes". First up is an amphibious lindworm, this guy heralds back to medieval stories of wyrms living in wells and rivers. They spend about as much time on land as they do in the water. For these and all wyrms, I want them to look almost prehistoric, like the ancestral mammal-like reptiles, (I'm thinking of creatures like Lycaenops). They're likely to be venomous and may kill their prey via constriction. The winged horses are not horses at all. They're based on the idea that early civilization easily mistook strange animals for something entirely different. For example, a manatee becoming a mermaid in the eyes of a sailor. These creatures will be rare herbivorous hexapods, having branched off from dragons very long ago. Their large guts (needed for digesting plant matter), make them too heavy to fly, but they retain their wings for gliding purposes. As the winged horses live high atop cliffs and hillsides (much like goats), their wings come in handy for quick getaways. If they are cornered or a predator ventures too near, they simply leap off the cliff and sail away to safety. Though the majority of the animal will be covered in feathers, the wings will be leathery like those of their ancestors. 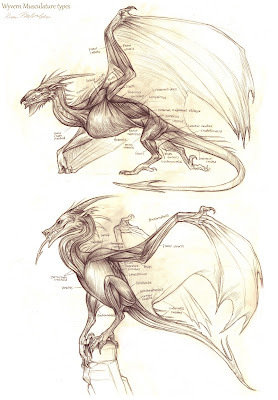 As there is no reason for a dragon to lose all their wing membrane and then regrow the wing composed of a new material. The wings however look very much like that of a bird, specifically an albatross in profile because of the feathery vanes the webbing forms. Right now I'm leaning toward the sketch in the bottom left corner. I'll make more sketches based off that one and continue to refine the creature design. The goal is that this animal must look powerful like a horse while still being lightweight and distinctive. It evolved from a carnivore after all, and while it should still be reminiscent of its namesake, it must also display hints as to its original nature. Some quickish muscle drawings, as though a wyvern is very easy to design anatomically in comparison to a hexapodal dragon; I myself have to figure out what wyverns in Aerie will look like. They'll have to exist alongside the larger hexapods without competing for the same niche. And will most likely be less intelligent and more colonial than their six-limbed cousins. A good comparison between the wyverns and the hexapods in Aerie would be that between wolves and coyotes. Farmers don't like either of them, but one is smaller, more troublesome, and much more numerous. There are multiple ways to structure a wyvern. Whether they're bird, bat or pterosaur based. Both of these are very bird like, with keeled sternums, coracoids and furcula. The first wyvern walks like a bat or a pterosaur would, and can gallop quite quickly when using its wings as forearms. It's thoracic vertebrae is only partially fused, leaving the spine semi- flexible. I imagine this guy as gliding and climbing a lot. This dragon is likely to be what an early wyvern would look like when transitioning from a hexapod to a four limbed biped. The bottom wyvern is essentially a modified heron, with a birds skeleton. This guy is smaller and can take off much more quickly. He's a bit more like a medieval wyvern with a snakish neck and tail, and a short bulbous midsection. The desired end result for the wyvern is something distinct from the hexapods, that will play off the creatures original mythological comparison to a viper. (The word "wyvern" comes from the latin 'vipera' for viper or asp) The wyverns will be small (in comparison to the hexapods), instinctual, clambering creatures, probably living along cliffs in colonial groups similar to seabirds, but hunting separately. They won't be venomous and are unlikely to breath fire, but will have barbed tails as they did in myth. Concept creature for the Aerie project. The idea was to design a large burly mountain goat. The Rams of which could adequately defend themselves and their harems of females from draconic predators. The females are fairly similar to the males, except for diminutive differences in the size of their horns and a lack of shaggy mane. 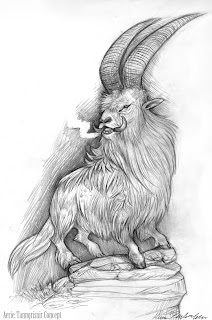 The goats are named after the animals that pulled Thor's chariot in Norse mythology. Tanngrisnir meaning "teeth-barer" or "snarler". The name owes to the animals habit of baring their teeth at threats, their sharp tusks, and their adequacy as beasts of burden. These sure-footed herd animals can pull a cart as well as any ox, and with markedly improved agility. As for the Aerie project, it started originally as an idea for a novel or series of novels with a dragon protagonist. And though this is likely where the idea will eventually culminate; in an effort to flush out the story, characters and world, I'm going to treat the property as if it were intended as a video game. 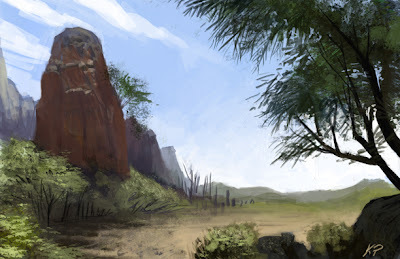 I will create concept artwork for wildlife, environments, weapons, vehicles, enemies, characters etc. The world of the Aerie takes place in a pre-apocalyptic fantasy earth with sci-influences. Human civilization has largely crumbled, governments have collapsed and the world has largely returned to wilderness, with only occasional reminders of the high tech development that preceded it. The word aerie (pronounced "eerie") refers to the nests of large birds of prey. In this world, Aerie is the name by which dragons refer to the earth. Concept 1, of a Mountain Goat inspired design. Concept 2, and likely the final. This one being more Bighorn Sheep inspired. There will eventually be a painted model sheet for this guy. 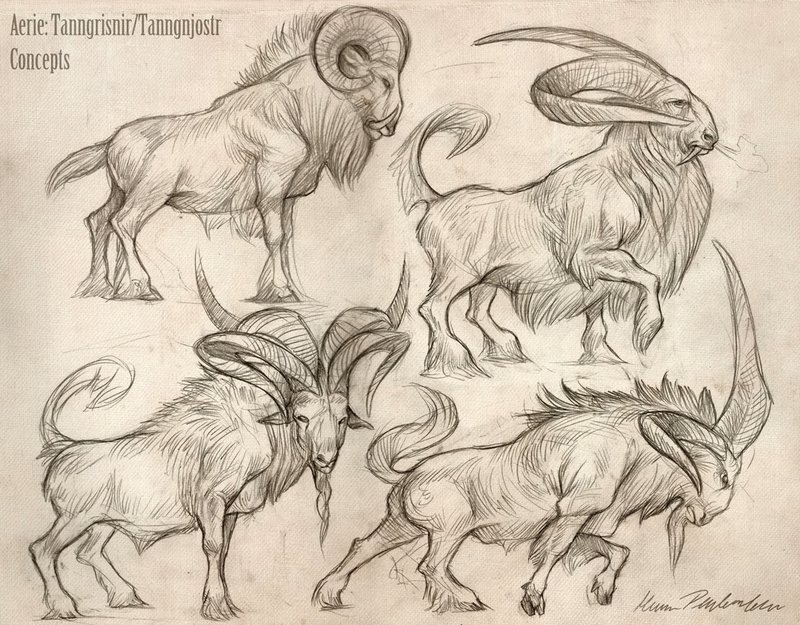 The next prey animals to be tackled will be a giant caribou/elk, a rhinoceros inspired unicorn, and a mammoth/mastodon equivalent. 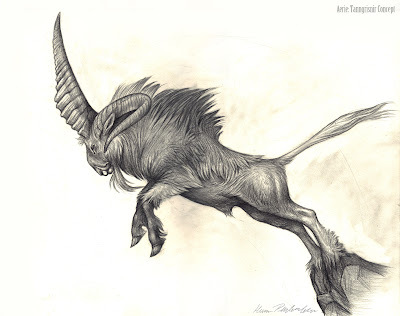 The creatures of the Aerie will largely be inspired by mythological beasts, but altered to look like probable relations or future evolutions of current world animals.